The Federal Motor Carrier Safety Administration (FMCSA) has an interest in how adverse weather may influence trucking industry practices, and what climate change might mean for future FMCSA efforts to reduce weather-related crashes. Weather conditions influence commercial motor vehicle (CMV) operations and driver safety through wet pavement, impaired visibility, heavy precipitation, frozen precipitation, flooding, high winds, extremes of temperature, and other factors. Climate variability and climate change may also increase these exposures by affecting the distribution, frequency, or intensity of those weather events. Regional, State, and/or local impacts projected by climate change studies may have future implications for CMV safety. Should climate change result in more frequent or intense storms affecting CMVs, the historic decline in weather-related crashes may level off. This could pose challenges to FMCSA's primary mission, and the agency may need to explore different strategies for reducing weather-related crashes, such as education and training programs or technologies that could alert drivers of adverse weather conditions. 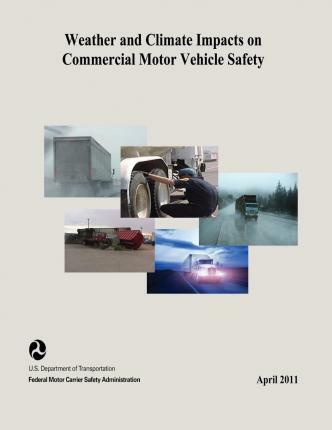 The purpose of this report is to provide the Federal Motor Carrier Safety Administration with an analysis on how existing weather conditions may affect the safe operation of commercial motor vehicles (CMVs) on our Nation's highways. Further, it also looks at the general impacts projected by climate change studies and hypothesizes how possible changes in weather patterns and extreme storms could affect CMV operations in the future. This includes climate changes that increase the potential of weather-related CMV crashes and those that may impact trucking industry practices to require a response in FMCSA regulatory enforcement.